At NAB Blackmagic Design announced ATEM Television Studio Pro HD, a broadcast quality all-in-one live production switcher with integrated hardware control panel. Company CEO Grant Petty described it as “a lot of switcher in a small design. It is fantastic for live production and we think quite affordable.” ATEM Television Studio Pro HD is available this month for US$2,295. Blackmagic also announced a new open protocol for URSA Mini Pro cameras that will allow users to create their own remote control solutions via Bluetooth. The protocol was demonstrated at NAB, with the API and sample code anticipated to be released to customers free of charge in June. 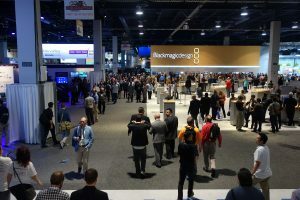 At the show the company also announced DaVinci Resolve 14, which Petty said is “the biggest release in the history of the product, and an update that has been designed to be more than an incremental software update, but a complete revolution in post production”. New features include up to 10 times performance improvement, a new audio post production suite with Fairlight audio built into DaVinci Resolve, and multi user collaboration tools that let multiple people edit, colour and mix audio from multiple systems. “The reason this company exists is to solve big problems in TV production workflows,” said Petty at an NAB press conference. “We acquired Fairlight and have built it into the Da Vinci Resolve. It will record ten orchestras while playing back another ten orchestras – it’s nuts! We think this is a big thing. The company says DaVinci Resolve Version 14 is like three high end applications in one. Users get professional editing, colour correction and the new Fairlight audio tools. All it takes is a single click to switch between editing, colour and audio. Then the new multi user collaboration tools let everyone work on the same project at the same time, so users no longer have to import, export, translate or conform projects. Blackmagic Design claims that DaVinci Resolve 14 changes post production from a linear to a parallel workflow, so everyone can work at the same time, giving editors, colourists and audio engineers more time to be creative.